If the west coast had a personality type, it would undoubtedly be that of a free-spirited nomad -- thoughtfully cozy without trying too hard. Get that laid back boho-style of the west coast on any coast by incorporating a few of these design elements into your home. Color || This design style focuses on a warm color palette much like the environment it was derived from. Rich jewel tones are balanced out with muted earthy hues to create a look that visually feels like the warm embrace of a hug. Don’t be afraid to layer your colors, but be mindful of their undertones. 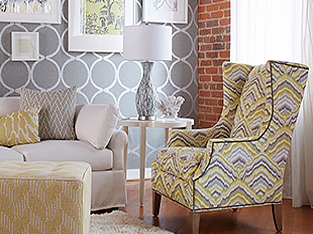 A cool color will clash in a room of warm colors taking your look from laidback to careless. Furniture || Think texture… like a buttery-soft leather sofa in whiskey brown that is just begging to be broken in. Boho-style embraces imperfections and like a fine wine, leather furniture just gets better with age. Pair leather pieces with well-worn woods, like a reclaimed coffee table to add a little structure into the mix. Finish off the look with a rattan accent chair for an unexpected touch of whimsy. Plants || Bring the desert inside by incorporating a few cactus plants into your design! Not only are they incredibly easy to manage (only needing to be watered once a month); they also come in so many shapes and sizes that you can mix and match them! For a more Cali-cool look, try a ponytail palm. Contrary to its name, it is actually a member of the succulent family, which means it can go long periods without water making it perfect for first time plant owners. Textiles || Just like color, layer your textiles. From throws to pillows to area rugs, these elements are meant to be layered to achieve that cozy, carefree vibe. Layer a Persian area rug with a cowhide. Mix your knit pillows with embellished pillows. The one common thread of all boho homes is their ability to encourage lounging. Layering your textiles is the easiest way to evoke that come-in-and-stay-awhile vibe.